Add rice and water to a small pot and bring to a boil, then reduce to medium-low heat. Let simmer for approx. 30 min., stirring often. Meanwhile, peel and mince garlic and ginger. In a frying pan, heat olive oil over medium-high heat. Add ginger and garlic and sauté for approx. 2 – 3 min., or until fragrant. Remove from heat, add salmon and season with salt and pepper. 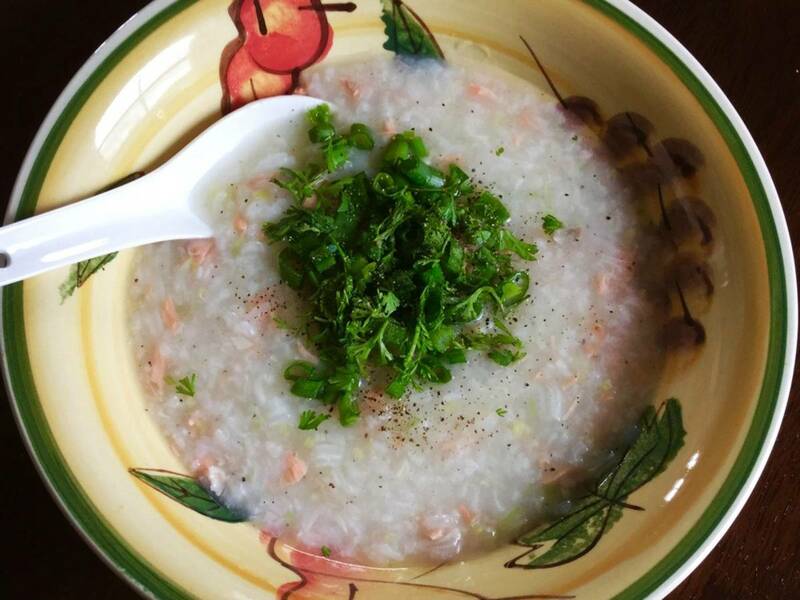 Transfer salmon to the rice porridge, add chicken stock powder and sugar. Season to taste with salt and pepper. Pull apart the salmon and mix into the porridge. Serve with sliced green onions and cilantro. Enjoy!